The primary function of a fire detection and alarm system is to give an early warning of fire in a building or premises in order to ensure the safety of the occupants by alerting them of the danger of a fire therefore increasing the time available to escape to safety or by initiation of other emergency actions. The secondary function is to reduce the loss of, or damage to, property by ensuring the early detection and therefore increasing the possibility of extinguishing the fire before it takes control. Therefore it is essential to have a fully functioning Fire Alarm Detection System and to make sure that this system is tested, serviced and maintained on a regular basis. Our team of expert fire prevention technicians will ensure that your fire alarm detection system is designed and maintained to the highest safety standards – Irish Standard (IS 3218- 2013), providing you with the peace of mind that your business or public premises is protected, to the highest degree, against fire risk. Emergency lighting is provided for use when the supply to the normal lighting fails and is therefore powered from a source independent of that supplying the normal lighting. The main function of an Emergency Lighting System is to ensure that in the event of a fire or some other event that plunges a building into darkness, the people in the building will be able to clearly and easily be able to find their way out of the building, thus ensuring that the risk of injury or loss of life is greatly reduced. Our team of Emergency Lighting technicians will ensure that your fire Emergency Lighting system is designed and maintained to the highest safety standards – Irish Standard (IS 3217:2013), providing you with the peace of mind that your business or public premises is protected in any event where the normal lighting systems fail. 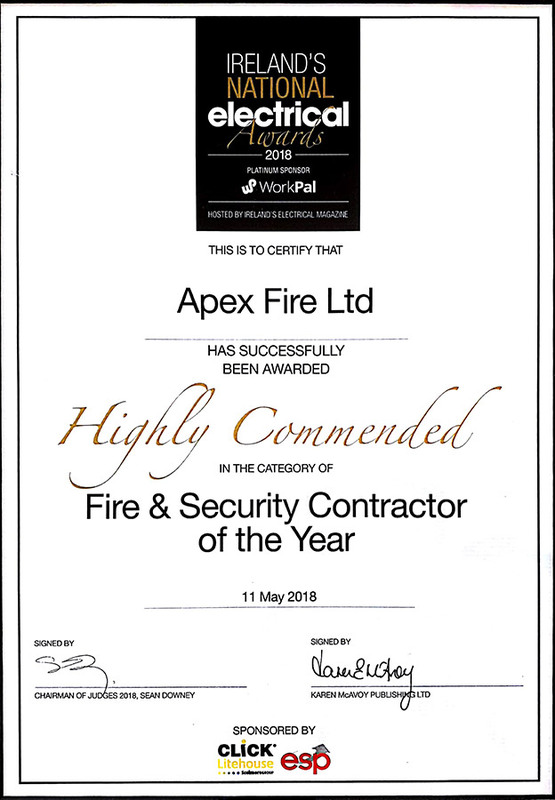 Apex Fire offers a complete fire alarm & emergency lighting design, supply, installation, commissioning, repair and maintenance service on a nationwide basis throughout Ireland. We supply, repair and service fire alarm & emergency lighting systems using only proven industry leading technology. We can install, service and maintain all types of fire alarm detection and emergency lighting systems all at fixed prices with no hidden extras on a nationwide basis. To get prices and arrange fire alarm & emergency lighting servicing or installation, simply contact us or call our friendly team at LoCall 1850 929829.